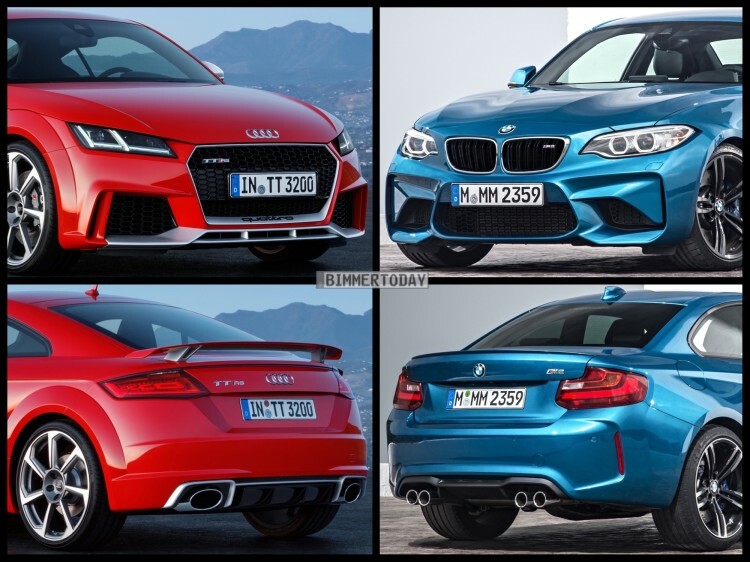 VIDEO: BMW M2 vs Porsche 718 Cayman S vs Audi TT RS -- Which is most fun? VIDEO: BMW M2 vs Porsche 718 Cayman S vs Audi TT RS — Which is most fun? The last and final test in a series of comparison tests from Drivetribe sees the BMW M2 take on the Porsche 718 Cayman S and Audi TT RS in a track day fun session. These three recently went up against each other in a few different tests to see how they performed. The first of which was just a weigh-in and power check, to see how each car compared on paper. Then there was a drag race between the two, in which the Audi TT RS won. Following that, there were some timed laps, where the Porsche was the fastest. But now comes the most important test. Which of the three is most fun? On the same Angelsey circuit where they tested each car’s hot laps, they take each car out for some hooligan fun. The best measure of a car’s balance and fun-factor is how well it will let you chuck it around. If a car likes to slide, is easy to hold through slides and can put a smile on your face, it’s a good car. 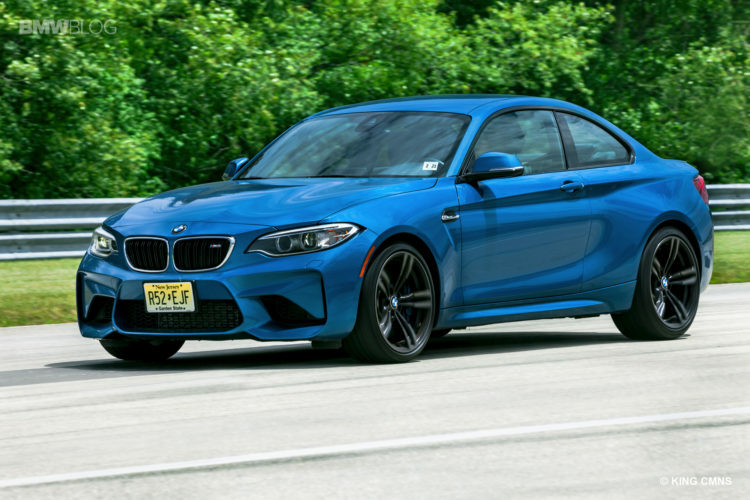 The BMW M2 is up first and it’s a proper hooligan. On a slightly damp Angelsey, the M2 is so easy to slide all over the place. Jethro Bovington, the host and driver, claims it to be fantastic on track for fun skids. The balance is there and almost perfect, as Bovington and just pick any angle and slide the M2 through it. Come in nice and tidy and powerslide out? No problem. Chuck it in late and and make lots of smoke? It loves it. It’s breadth of sliding abilities is actually pretty impressive. However, that doesn’t translate that well on the road, where its suspension is a bit too firm, and its brakes aren’t so good for proper hot laps. So the M2 is incredibly fun when being a hooligan but does have its issues. Next up is the Audi TT RS. This being the only all-wheel drive, automatic car in the test, it’s naturally at a disadvantage here. Though, it isn’t all doom and gloom. Yes, the TT RS’ primary driving characteristic on track is understeer. However, if you learn the car and get everything right, it can rotate nicely and be quite fun. The only problem is that it’s a lot of work and very hard to replicate. While some sports cars reward hard work, the TT RS is brutally difficult to consistently get right. It does have some strong suits, though. Its engine is brilliant and exciting, its brakes are good and it is incredibly quick. However, it’s just not playful enough and not as fun as the other two. Lastly, the Porsche 718 Cayman S hits the track. With a six-speed manual and mid-engine balance, the Porsche has the best advantage here. Its steering is precise, its balance is even better than the BMW’s and it’s just so playful. It also has the benefit of being the only car designed as a proper sports car from the ground up. The Audi TT is a cheaper front-wheel drive diesel coupe in most countries. The BMW 2 Series is the cheapest BMW in America. So both cars have humble roots. The Cayman is a blue-blooded sports car. Its only downside is its engine, which is pretty awful, actually. It makes good power and has a bunch of torque but sounds like a diesel generator and isn’t befitting of a Volkswagen Golf R, never mind a Porsche. All three cars have flaws, none are perfect. But the best car overall, according to Drivetribe is the Porsche 718 Cayman S. It’s the most fun on a track, fastest on a track and damn quick in a drag race. Its only knocks against it are its price and engine. The other cars have their own faults, too. Porsche just overcomes its problems a bit better.